What happens to the electorate when you tighten up rules for voting? 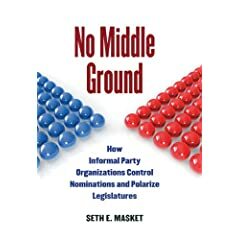 Does everyone have a harder time voting, or are some groups of voters affected more than others? We got some evidence on this question in Colorado recently. For several election cycles, Colorado has provided mail-in ballots automatically to those who have registered as requesting mail-in ballots in previous cycles. In late 2011, Secretary of State Scott Gessler announced that the state's mail-in ballots would henceforth only be sent out automatically to those who were "active" voters, meaning they had voted in the last general election. 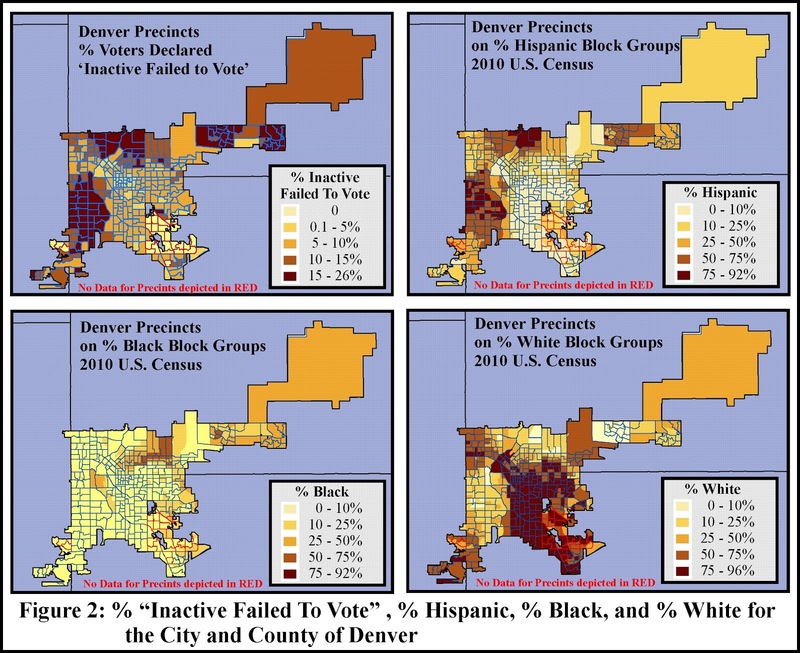 This led to a dispute between Gessler's office and the counties of Denver and Pueblo, with the Brennan Center and Colorado Common Cause getting involved. I was brought in as an expert witness to help determine the effect that the change would have on the electorate, specifically with regards to race. 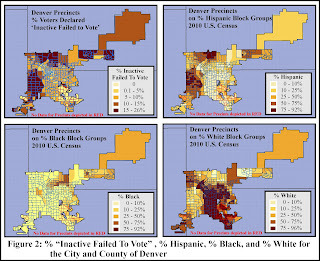 I found these same patterns within Pueblo County and across the state as a whole. 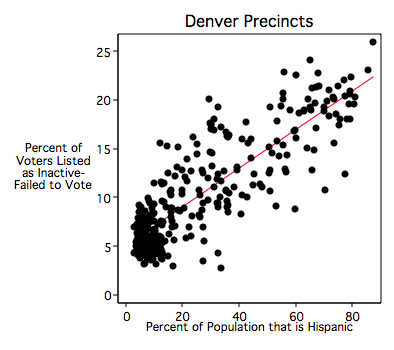 Again, the trend is quite consistent: the higher concentration of a racial minority group within a precinct, the more people in that precinct who did not vote in the previous general election, and the more people who would be deprived of an automatic mail-in ballot. 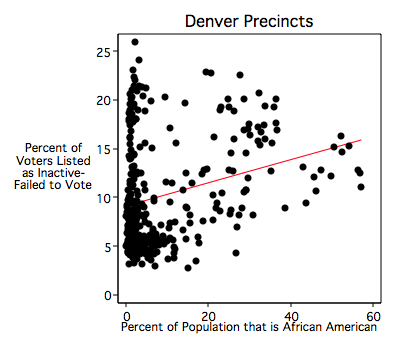 Now, there is an ecological inference issue here: I'm making individual-level interpretations using precinct-level data. To try to get around this, I employed the ecological inference program Eco to make some approximations of the individual-level behavior. The results estimated that roughly 10 percent of eligible white voters were IFTV status, but roughly a third of Latinos and African Americans were IFTV status. The change in the rule on mail-in ballots would have meant racial minorities having a harder time voting by mail than whites. Based partially on this analysis, the judge in the case ruled against Gessler, and the change in mail-in voter policy is not being implemented. But given partisan voting patterns among different racial groups, it's not hard to imagine how this would have played out electorally had it been enforced. buying posters online it's a good thing if you need an original picture but don't have the time to deal with it on your own. When you order a PDF poster at PrimeEssays.com, be sure that you will get an original picture containing relevant information regarding your topic.